The following photos were taken as "promo shots" for our live performances. Enjoy!! 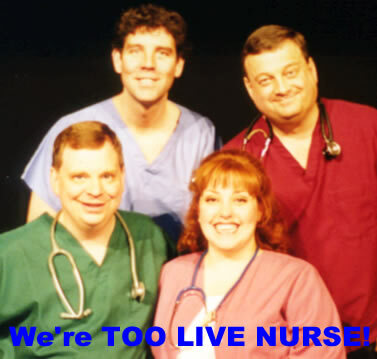 TOO LIVE NURSE is just a bunch of "Divas" who want to sing, dance and make you laugh!! 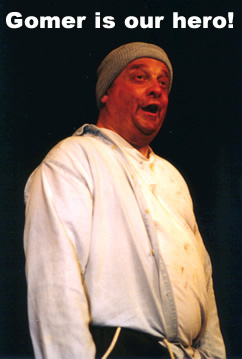 Meet Mr. Gomer Gominsky. He may smell and scratch a lot, but he's one hell-of-a-guy! We love him! 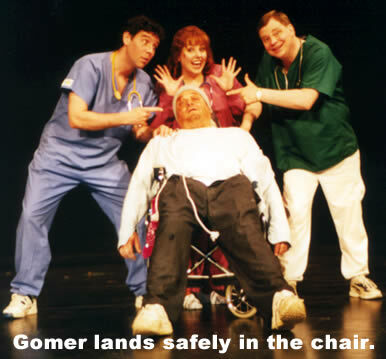 Gomer lands safely into the chair. No fractured bones today . . . no reams of paperwork to fill out! 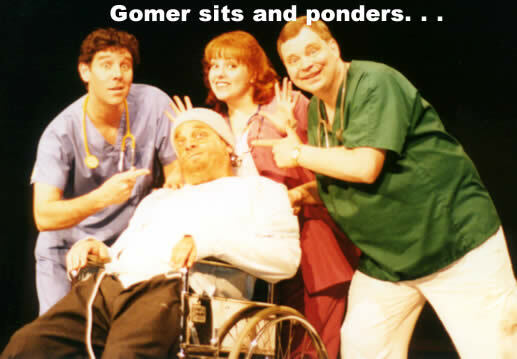 Gomer is a "Thinking Man". He has ideas and thoughts . . . but what are they about? 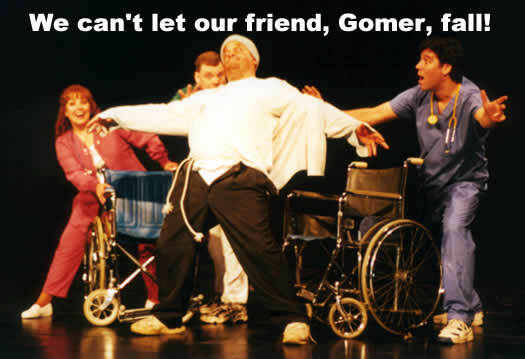 Gomer is our hero. He reminds us about the importance of providing compassionate nursing care for everyone. Watch Who's got the Keys? to find out how! 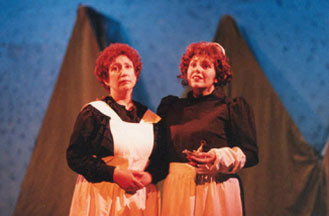 Taken from a live performance of Who's Got the Keys?, this picture shows Florence Nightingale (on the right) patiently teaching a student nurse (on the left). This is Florence Nightingale after one too many bad entanglements with doctors, lawyers, and HMO CEO's! What is she going to do with that whip? "Wild Flo" with a Doctor, Lawyer, and CEO . . . oh wow, the whip!!! Take a ride on the "wild side" with TOO LIVE NURSE! Meet Fanny Scratchit, RN, PhD, FAAN, FAART. 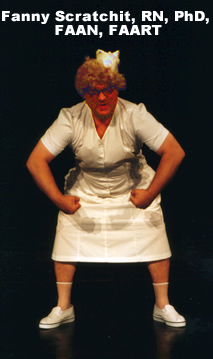 She's the head of QA at Sarie Gamp's Enema Camp. 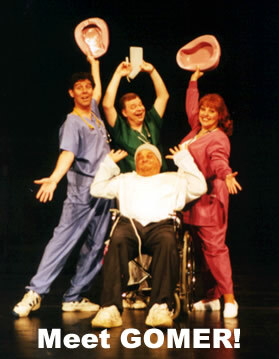 After demonstrating the insertion of a foley catheter (male), Nurse Scratchit says, "You can kiss that urinal good-bye!" 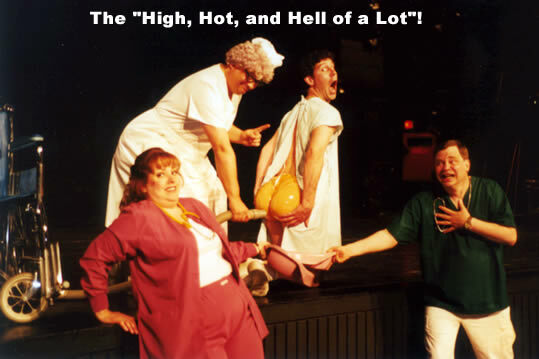 Concerned about QA at the "... Enema Camp", Nurse Scratchit demonstrates the administration of the "High, Hot, and Hell of a Lot"! Always knock before entering the patient's bathroom! 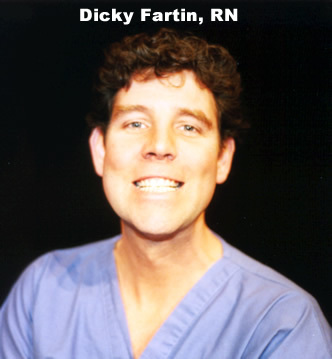 Meet Dicky Fartin, RN. He's learning the new ACLS protocols and is feeling kind of crazy. He'll sing to you, Nursing La Vida Loca! !